European Council President and former Polish Prime Minister Donal Tusk yesterday said that the European Union GSP+ concession is on the verge of being restored to Sri Lanka due to the political and social reforms in progress in the country. He commended the outstanding efforts, commitment and sacrifices made by Prime Minister Ranil Wickremesinghe in restoring democracy in a country which earlier was heading for authoritarism, corruption and horror. He said his organisation was prepared to extend the fullest cooperation in restoring the GSP+ concessions to Sri Lanka considering the commitment of Prime Minister Wickremesinghe and the people of Sri Lanka towards strengthening democracy. The European Union president made these remarks when the Prime Minister called on him at the European Council headquarters in Brussels yesterday. 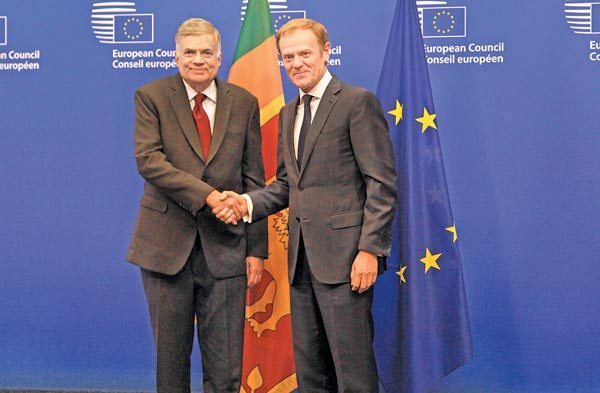 Prime Minister Wickremesinghe said he would establish a Task Force aimed at curbing illegal migrants to Europe after European Council president Donal Tusk requested the Prime Minister to pay special focus on curbing illegal migrants to Europe. “This Task Force would comprise officials of the Law and Order and Justice Ministry and the Immigration and Emigration Department,” he said. The Prime Minister added that the European Council can also join in this process. Tusk said Premier Wickremesinghe had been emphasising the importance of having a national government in Sri Lanka for years. “Sri Lanka has set an example to other nations in the region by establishing a consensus government,” he said. Tusk lauded the Premier for his untiring efforts to ensure political stability in the country under the guidance of President Maithripala Sirisena. The EU Council president said the entire European Council commended his efforts to establish democracy and good governance in the country. 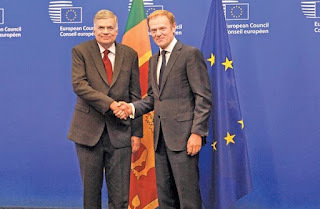 Prime Minister Wickremesinghe while expressing his gratitude to the European Council for helping Sri Lanka to face challenges in the economic sphere extended an invitation to Tusk on behalf of President Sirisena, to visit Sri Lanka. Premier Wickremesinghe said that the European Council chief would be able to receive first hand information about the democratic and political reforms being implemented in Sri Lanka, during an official visit to Sri Lanka. Tusk while accepting the invitation said that he expects to visit Sri Lanka next year. Chief of Prime Minister’s staff and Law and Order and Southern Development Minister Sagala Ratnayaka and Secretary to the Prime Minister Saman Ekanayake were present.